As you might have seen, Vigeteers love Halloween. Because we enjoy Halloween as well as reasons to celebrate, it's a tradition here at Viget to invite the kids of staff to come in to our office to show off their flashy costumes and collect treats. 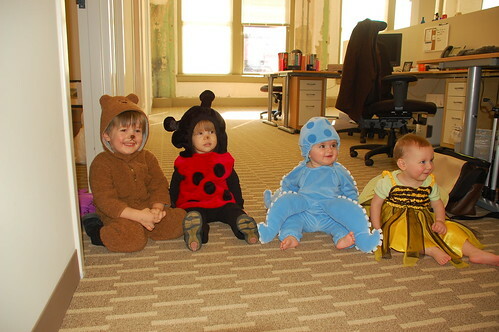 Last week in both offices, we hosted about ten children clad in impressive (as always!) Halloween attire. Check it out! One of the hazards of playing host to festivities like this one is that everyone likes to encourage us to keep the leftover candy. And there was a LOT of leftover candy. Which is now gone, save for a sad few Laffy Taffies that no one likes. Aside from the candy-gorging, our parties were absolute successes. Everyone is looking forward to next year's costumes already! Special thanks to Julia for all her help with the project and to all that came out!